Start building your body today. We’ll show you how. REAL FITNESS TRAINING. A COMMUNITY YOU’LL LOVE! Quality Video Training + Supportive Community + Ask Questions Anytime. Access to our private support community. Build relationships and get the accountability, support and feedback you need. Workbooks, exercises and full workouts. Easy to follow workouts that can done at home with minimal to no equipment. Ask questions anytime. Actually get an answer. Pretty cool eh? Instructed and developed by Registered Kinesiologists and certified Fitness Professionals who know what their talking about. Get a complete fitness education and move from being a beginner to pro in no time. "When I first started exercising I found it very challenging and sometimes painful. The Motivation Mastery course in Fitness For Freedom laid out small steps I could take to make progressive changes over time. Sometimes I still get pain when I exercise but now 5 years later I can do things I never thought would be possible like hiking up mountains and competing in triathlons. " "I have been using My.fit for almost a year now, and I love the new lifestyle and routine I have created. I have had gym memberships in the past, but could never seem to keep a steady routine with my busy schedule. My.fit allows me to workout in my home, at my convenience with workouts catered to my needs and wants. I’m spending less time working out, yet seeing better results then ever before, both in the way I feel and look. It’s easy to track your workouts and progress, which for me, helps to keep me motivated. The nutrition plan is easy to follow and very flexible to cater to my lifestyle. My trainer has been easily accessible to answer any of my questions, as well as to tailor my workouts to get the results I’m looking for. I could not be happier with the choice to join My.fit, and make the commitment to a healthier lifestyle. I look forward to reaching new goals! Thank you Fitness for Freedom!. " Yes! All of our instructors have degree backgrounds in Kinesiology, Human Kinetics or Exercise Science. Our instructors have diverse backgrounds and certifications such as Registered Kinesiologists, Certified Strength and Condition Specialists, Exercise Physiologist and Certified Personal Trainers. Our primary instructor Jonathan Chant has been a personal trainer for over 10 years, is a Registered Kinesiologist and Certified Strength and Conditioning Specialist. All of our trainers are highly qualified and go through a rigorous selection process. That being said, they all specialize in one thing, which is getting you the best workout possible, from the comfort of your own home. No. All of our courses are designed to be done at home with no equipment or items that can be found around your home. Can I do the workouts at the gym? Of course. Even though all of our courses are designed to be done at home, they are designed to truly be done at the most convenient place for you. Whether that is your home, office, gym or hotel room, our workouts will give you the same great results no matter where you decide to workout. What if I don't understand something in the course? If you are not sure how to do one of our exercises or have questions still at any point, simply click the 'ask us your fitness questions' button and someone from our team will respond to you within 24 hours on an business day. What Courses are currently in My Fitness For Freedom? Our training is always straight-forward, clear and action oriented. All of our trainers are degree educated and design all workouts to be done at home with little to no equipment. Every course and each lesson serves a purpose in your journey towards living a healthier lifestyle for you can have the freedom to life your life the way you want. My Fitness For Freedom focuses on creating fitness routines that are sustainable and easy for you to do. The ability to ask questions directly and get a response from a trainer within 24 hours as well as workouts and the ability to track your progress and routines is always available to you . We are always working on new courses to add to our community. 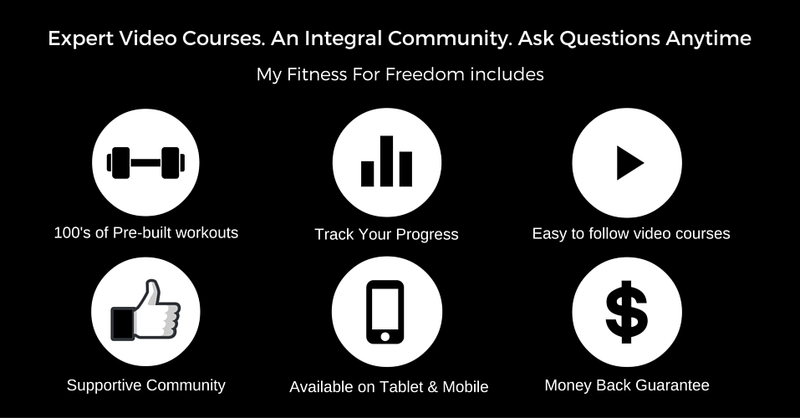 Here are the courses that are currently inside My Fitness For Freedom. Staying motivated is one of the most difficult things when trying to make changes. That's why we designed this course. We want to help you get back on the bandwagon when you fall off. So you can finally make the changes you have been wanting to make. This is a beginners guide to learn how to exercise. By the end of this course you will be able to understand how long you should exercise for, be able to do the most basic and important exercises that all other exercises are based off, understand the different types of exercise, why each one is important and follow along and use several basic exercise programs to get you started. These 7 lessons will give you explanations and demonstrations of the 7 exercises you need to know how to do, because every exercise you do is based off of them. In this course you will discover what cardiovascular training is and it's key benefits. This course is designed for people who are new to cardiovascular training or for people who have not done cardiovascular training in a long time. Through these 6 lessons you will learn some basic tips and insights to on how to structure your program and why you should be doing cardio training. Welcome to the Low Back Pain Course. Most people at some point in their lives will suffer from back pain, either daily or because of an acute injury. This course will give you tools on how to manage your back pain and prevent it from happening in the future. The push-up is one of, if not the most common exercise, when we think of exercising. It's a staple in almost every fitness testing assessment from the military to general health assessments. Unfortunately, most people still do them incorrectly. This course will teach you how to do a proper push-up, what the different 'basic' variations are and how to modify them if something hurts. Before undertaking this challenge we recommend you first complete the Introduction to the Push-Up course. In this course we are going to cover proper push-up form, what some of the different variations are, what makes them different and right for you. Once you understand the proper form and concepts of what makes a good push-up and all the different variations. 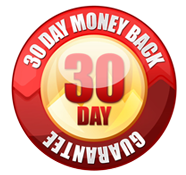 We will then go through the calendar and specifities of each phase you need to follow to achieve your desired outcome of doing 10 Push-Ups in 10 Weeks. We will show you how to use the muscles of the core, how they work and what they do. This is your guide to better upper back posture. Learn about the anatomy of the upper back and postural exercises you can do to help correct and improve your posture. Awesome! You made it all this way. Click This and Start Today! We’re Beta testing! Join our community and help us build it to suit you!